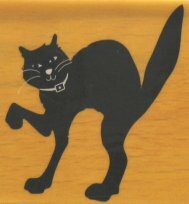 Here is a classic cat design for Halloween. This new rubber stamp is 1 1/2" wide x 1 3/4" high. New, unused.